New Year, New and Improved Yesware Appsite! We are ringing in 2015 by rolling out a variety of highly sought after feature updates, including a more easily navigable and adaptable Appsite, the ability to reuse mailing lists from a previous Mail Merge, and an improved Template experience. 1. No more tabs! If you want to navigate, look left young (wo)man. Almost everything you can do on the Appsite is included in the left hand menu now. 2. Navigation is more functional. 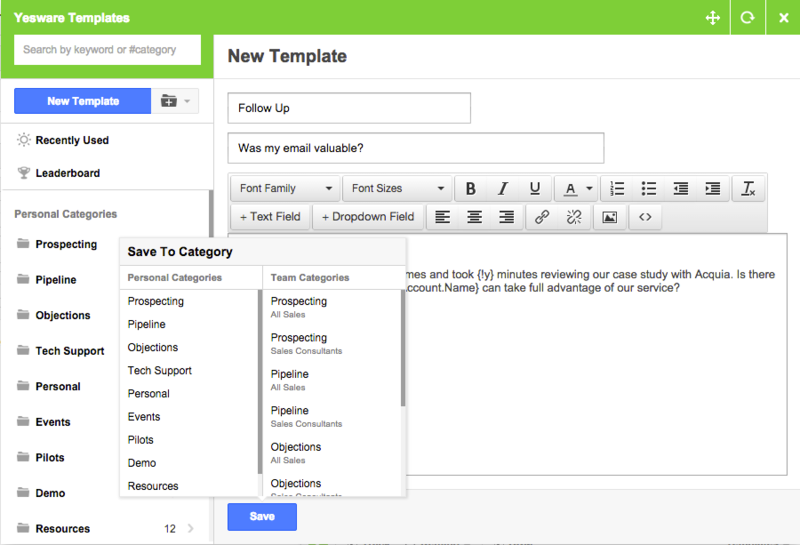 Our Appsite houses the top two navigational items, your reports and your templates. You can view both personal and team reports or templates under those sections. 3. Adaptable to various screen sizes. Before we had a fixed width; now Appsite pages easily adapt to individual computer screen sizes. You can also chose to view reports in full screen if you’d like. No need to upload a new list every time you send out a mail merge. You can now check off a list of recipients from a previously sent mail merge. You can also filter by “opened” and “replied” recipients, to make sure you follow up until you’ve contacted every person on your list. No limit on Template Categories — That’s right, template category limits have been lifted, so you can now create as many time saving templates as you’d like! Editing Abilities for Team Leaders in Gmail. Team leaders can now create new team templates and template categories, edit existing templates, or delete those no longer useful to them directly from Gmail. Which of these updates is most helpful to you? Are there any you’re hoping to see soon? Let us know in the comments section.